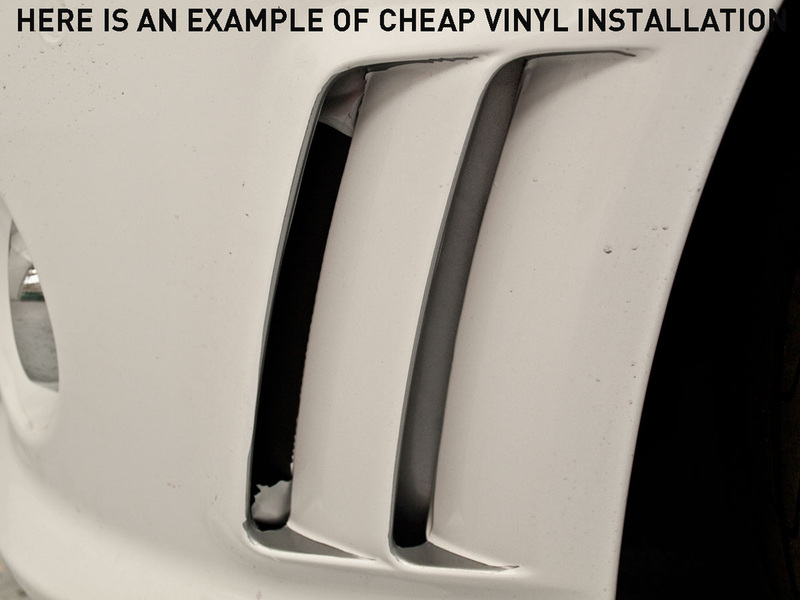 We get many questions about vinyl wrapping and why, if it’s a simple as the concept suggests, then why can’t they install them at home. 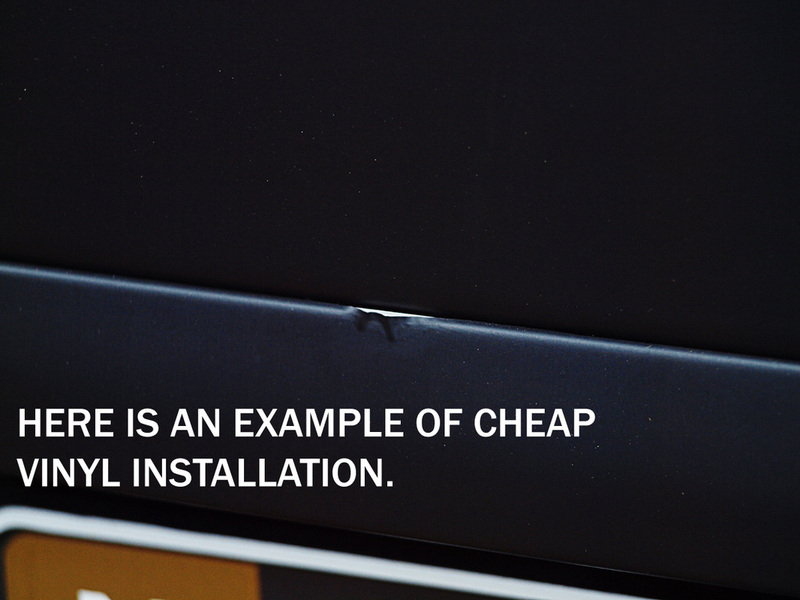 Why should they go to a certified installer? 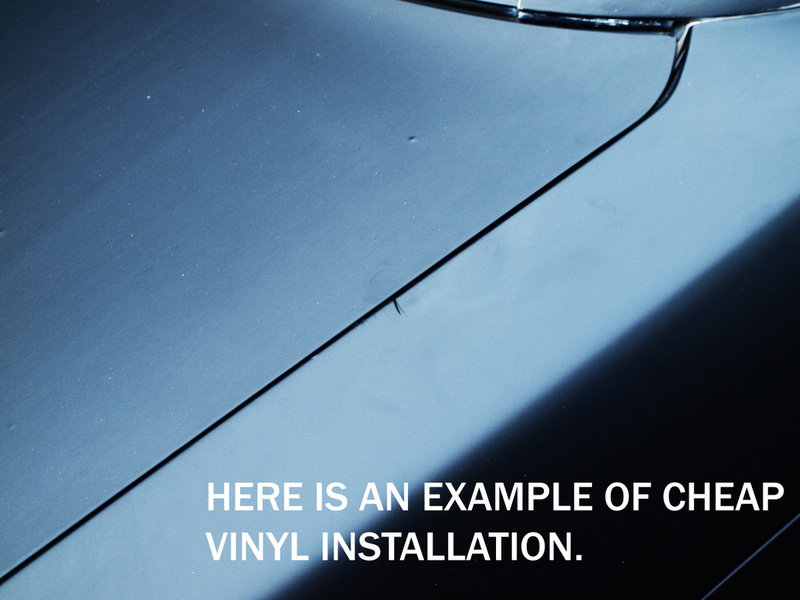 To answer some of these questions, the Provinyl team has written this in depth article to help explain all stages involved, from cleaning the car to the finished application. 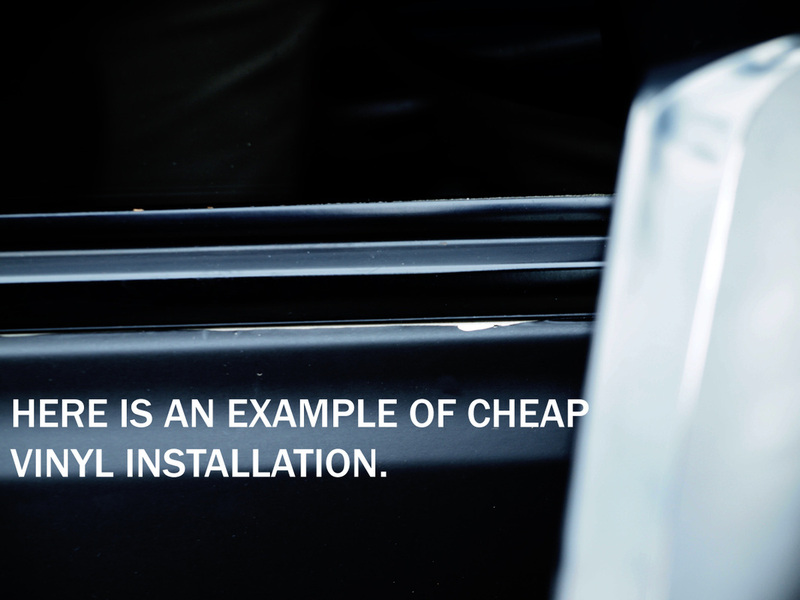 We’re also trying to inform any potential clients as to why you should choose a certified installer will benefit your car and your wallet in the long run. To start off, the price of the material can vary from $10 (Chinese counterparts) to $160 (3M) per linear meter. 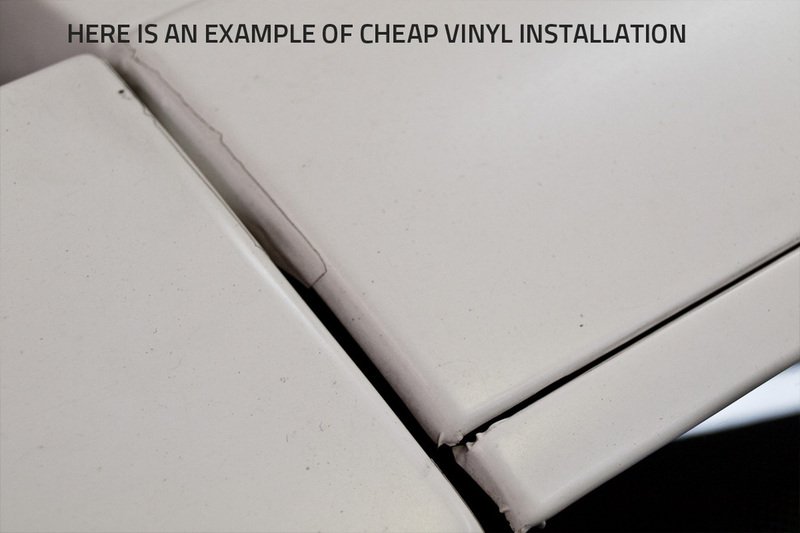 The difference in prices here is always a major factor in the final price, and often choosing the cheaper materials with cost you more in the long term due to replacement and re-installation of vinyl. 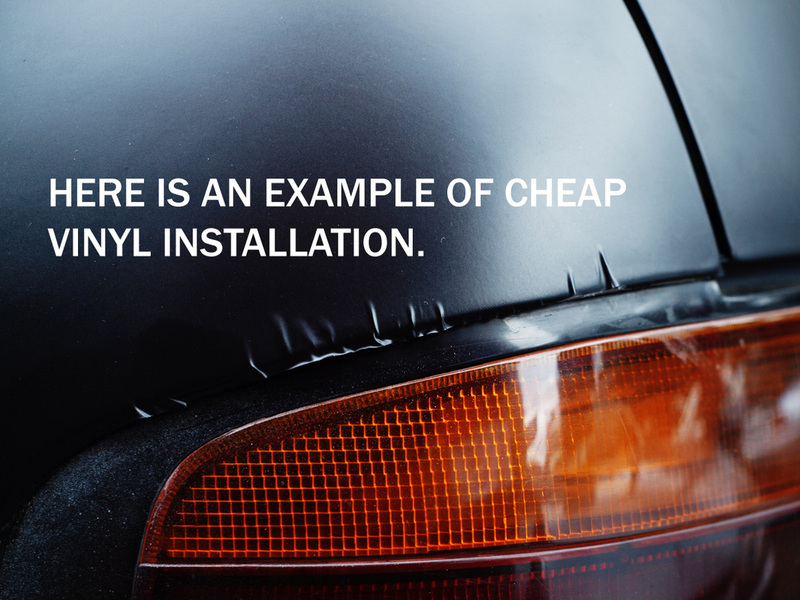 When vinyl is used on a car exterior, the high requirements of the material are to ensure that what we promise our clients is the truth. 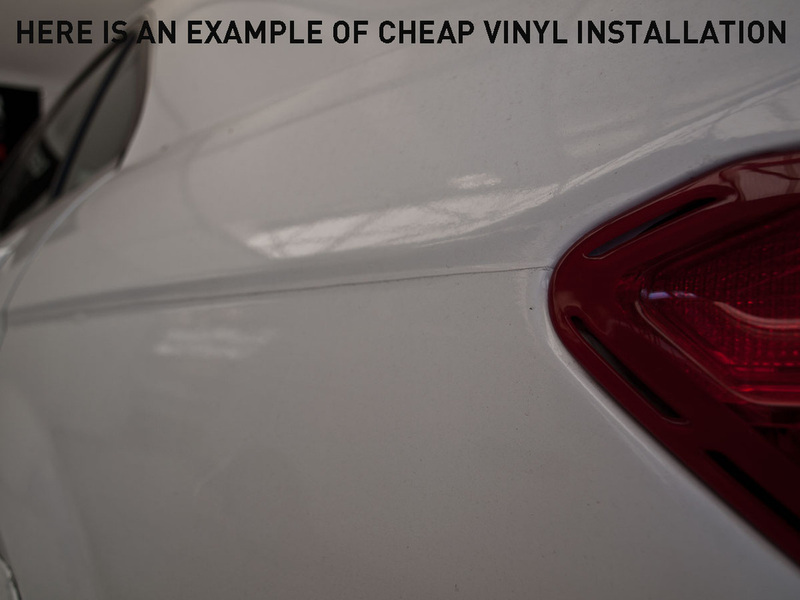 The vinyl has to ensure protection to the paint from day to day wear, from factors such as sun damage, stone chips or accidental scratches from simple things like walking past your car. 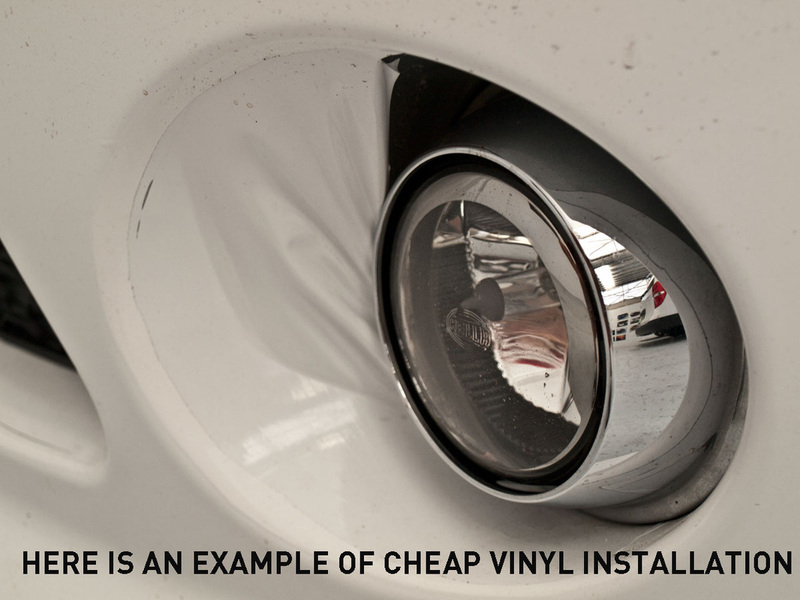 The vinyl’s we use are all up to these standards as well as holding a 5-year warrantee and being completely removable without any damage to the paintwork. 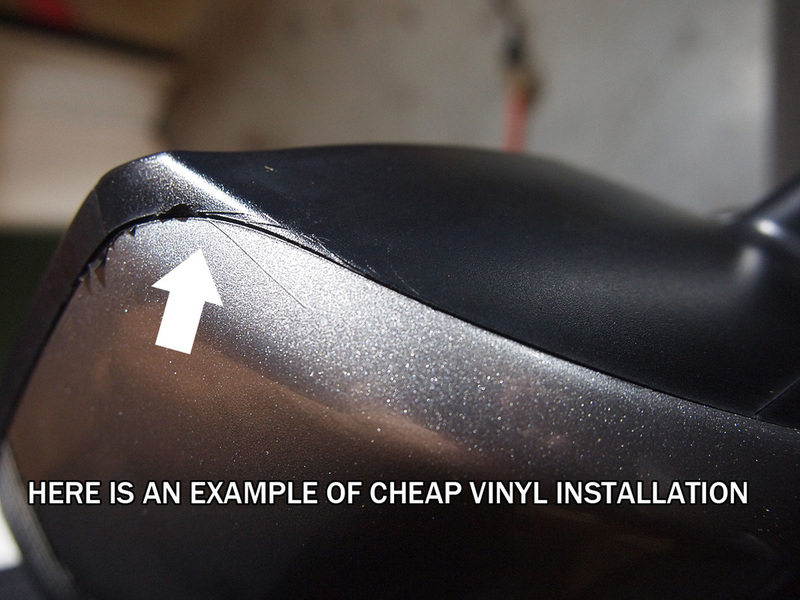 When a cheap vinyl is used, over time, the colour can fade, and the glue can also become damaged. 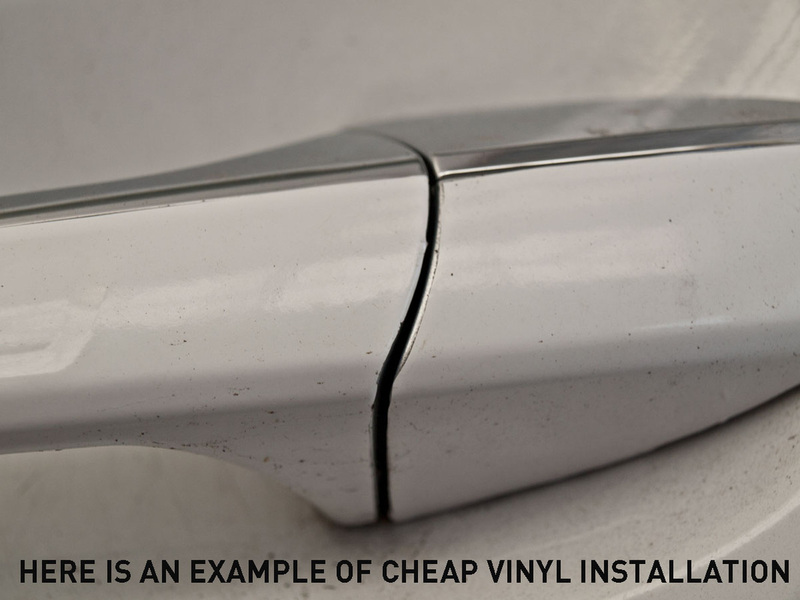 This all becomes very apparent when removing the vinyl; in worst cases paint can even be damaged or removed. 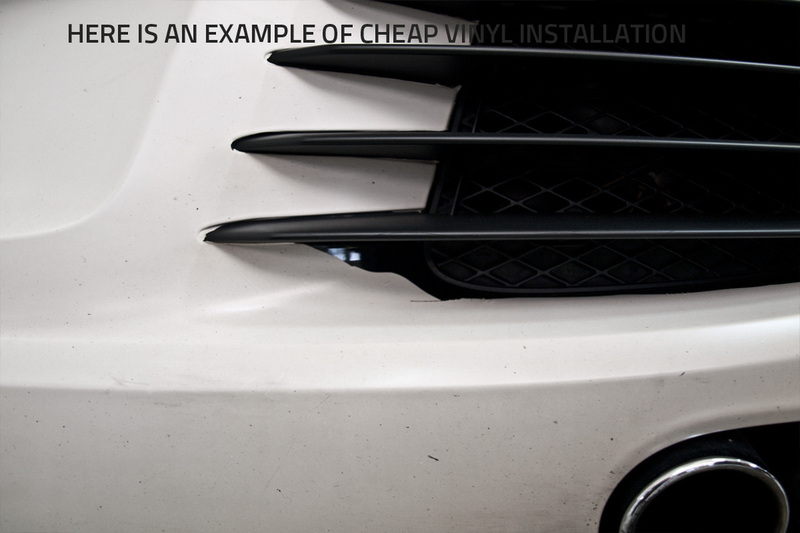 We only choose the best materials to give you the piece of mind that you pride and joy will stay in pristine condition, and the vinyl you choose will hold its colour and finish for years to come. The preparation process takes up one third of the entire job. 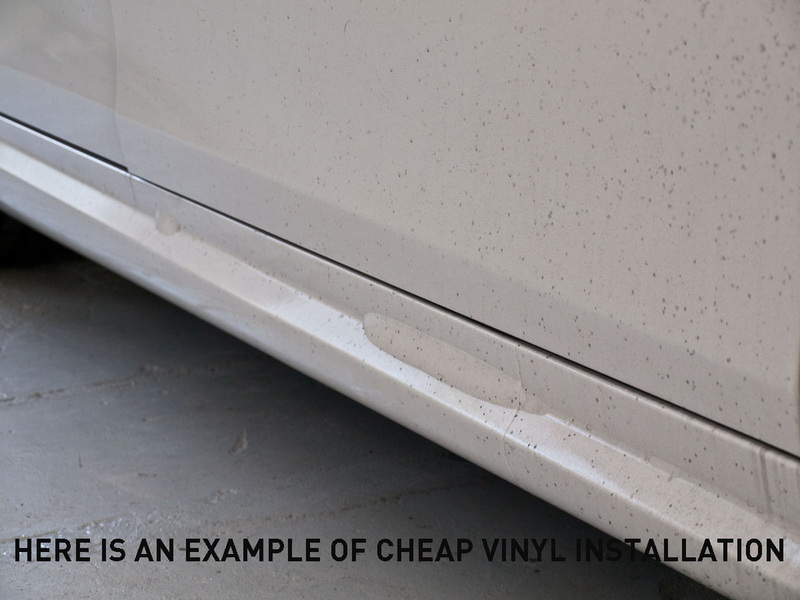 The installer must completely clean the entire surface of the car. 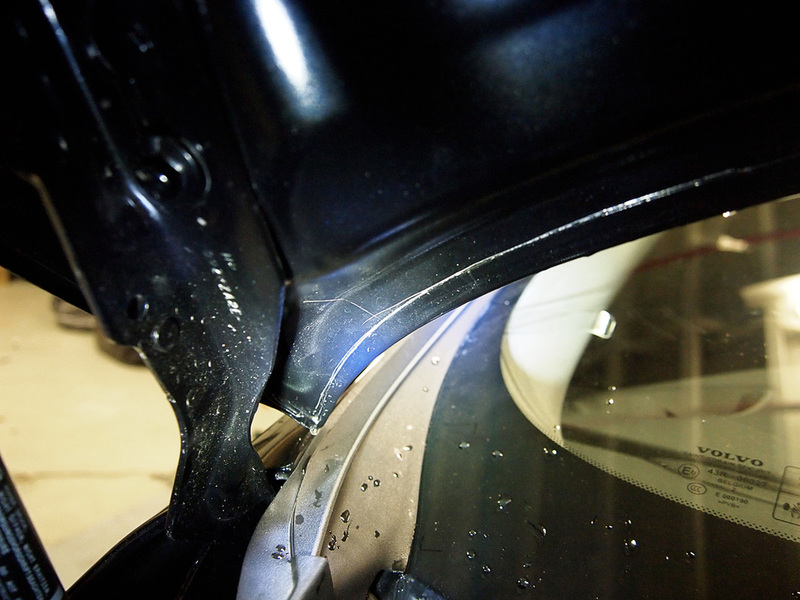 All surfaces need to be cleaned from all dirt, and then degrease. 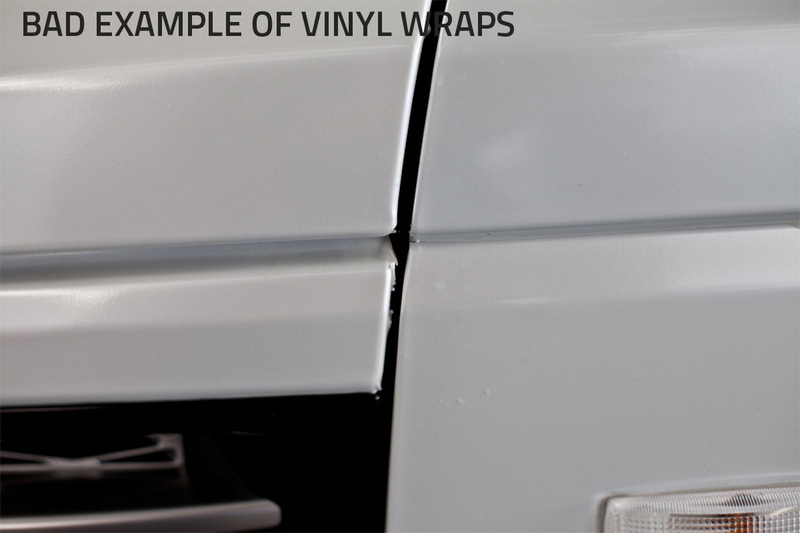 To ensure the vinyl does not let go of the surface, it needs to be prepared perfectly, any surface that will have vinyl applied, including the bodywork that isn't seen. 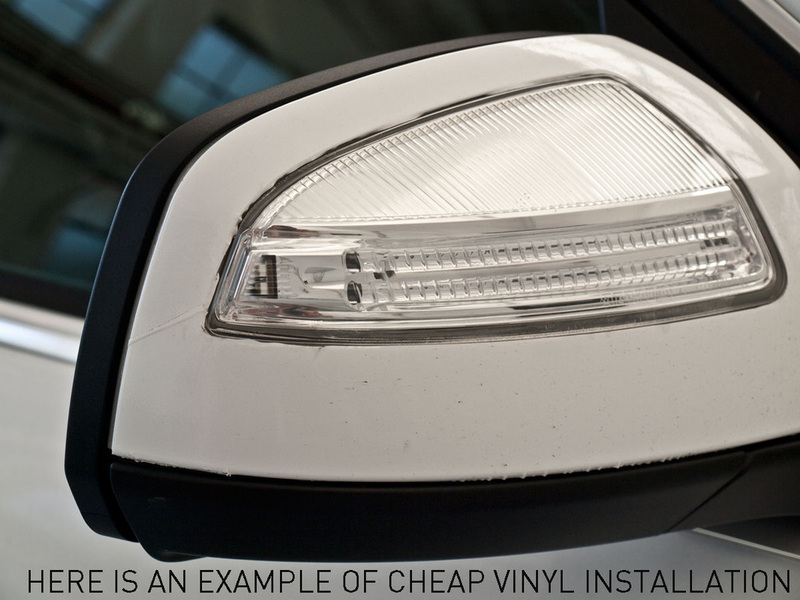 For a higher quality installation, all logos and indicators are removed or covered if necessary. 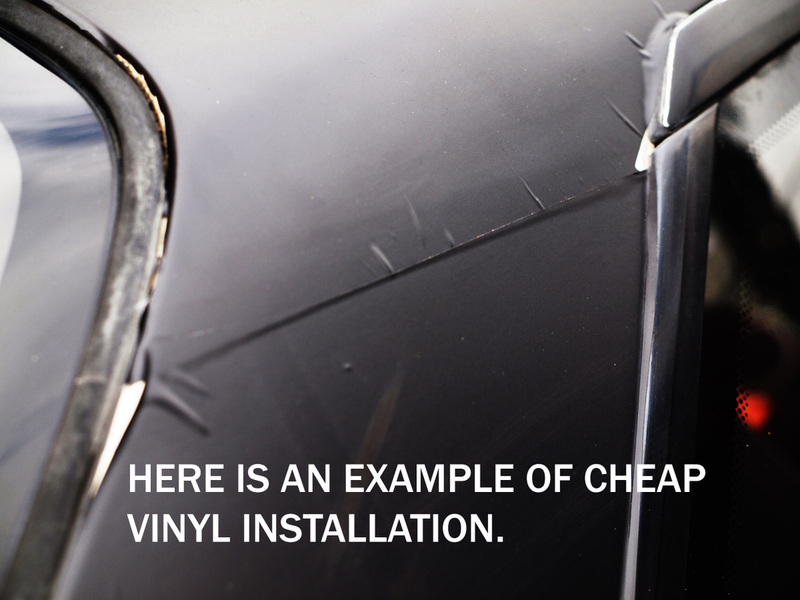 Any easily removable parts are taken off to have the smoothest surface possible. 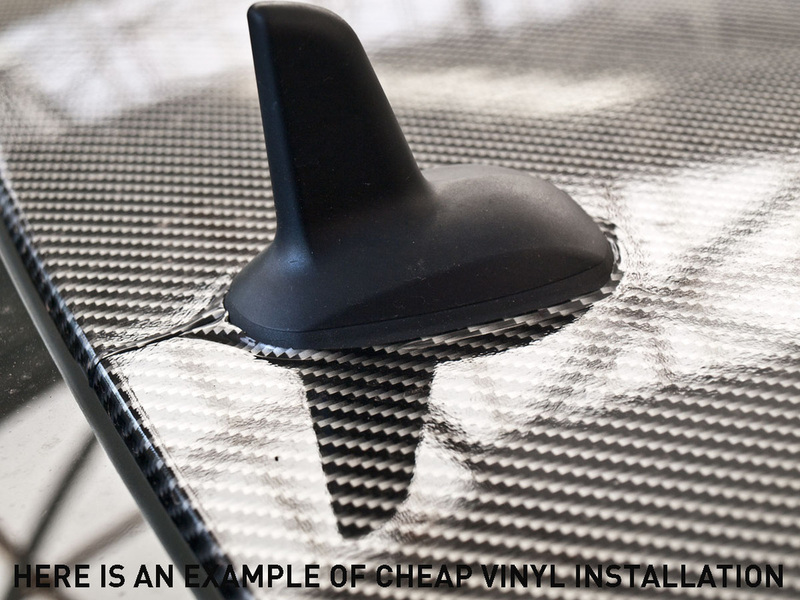 Once the item surface is completely free of any dust the underside edges are covered with a superimposed thin and narrow strip of primer that allows the vinyl to stay in its shape and not shrink or move under heat or time. 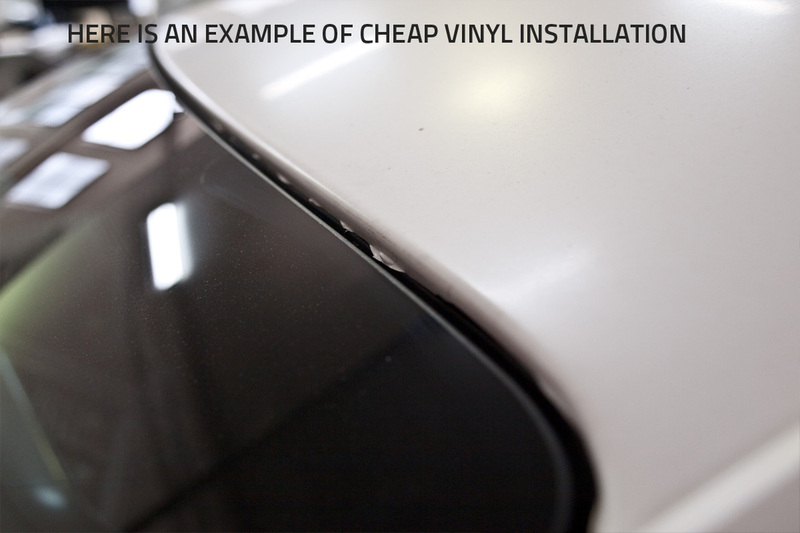 It large factor in application is calculating in advance where and how to stretch the vinyl during application, over stretching vinyl can cause compromised contact with the surface, as the glue can become stretched. 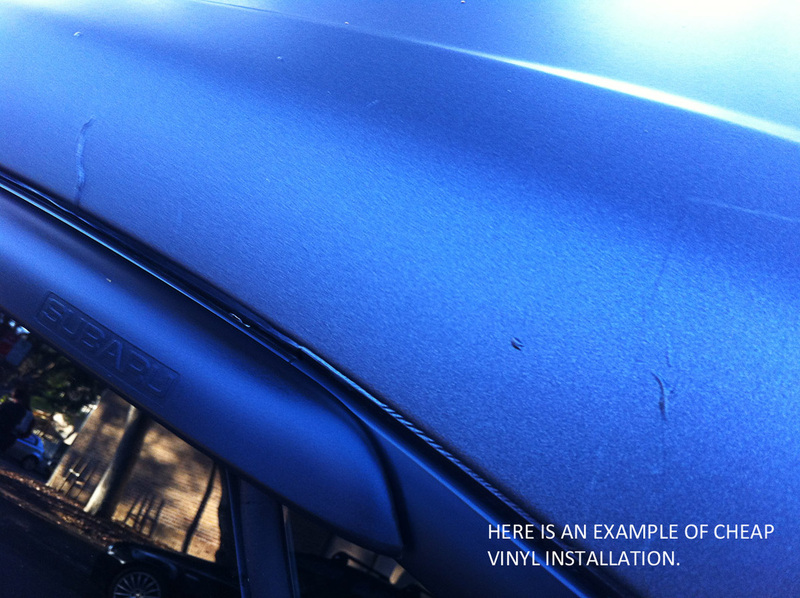 All this needs to completed quickly to ensure no dust finds it’s was back onto the surface of the car, or the vinyl. 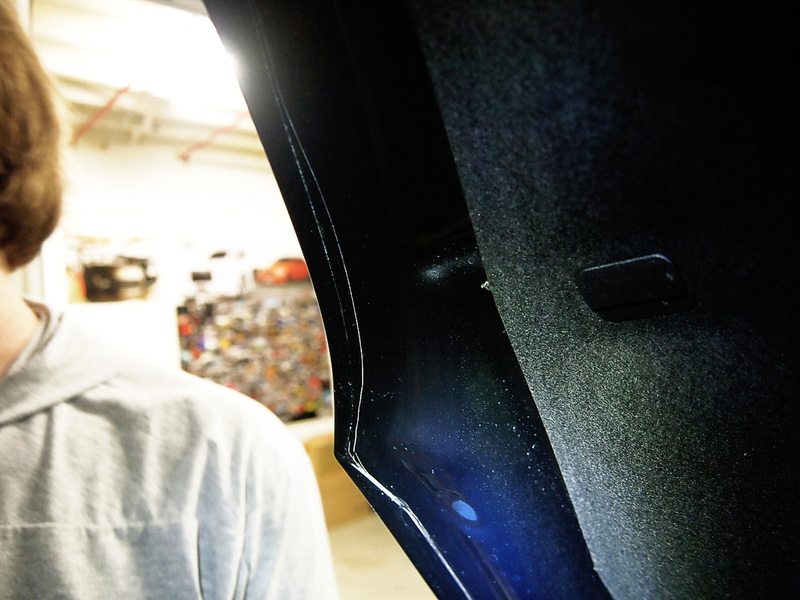 Complex surfaces like bumpers require special expertise and skillful execution. Trimming is another consuming process, which requires experience from a master installer. 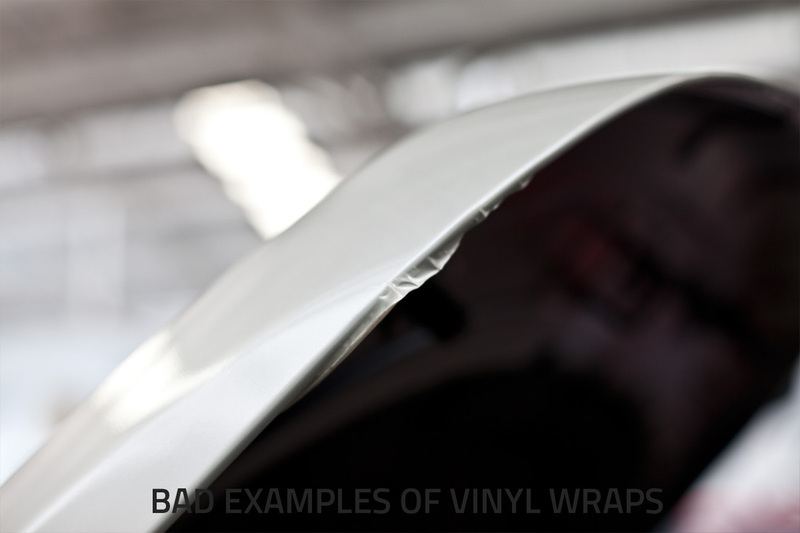 Cutting away excess vinyl ensures the surface is completely smooth, and wrapped to the edge with no visibility of what is underneath. It is not acceptable to have any creases visible or colour showing from the original panel. One mistake at this stage, and the entire process has to be started again and re-applied. A post application heating of the entire surface to 90-110 Degrees Celsius along with silicone along the edges where it is most vulnerable to external factors. Still want it cheaper? Don't expect the highest quality. 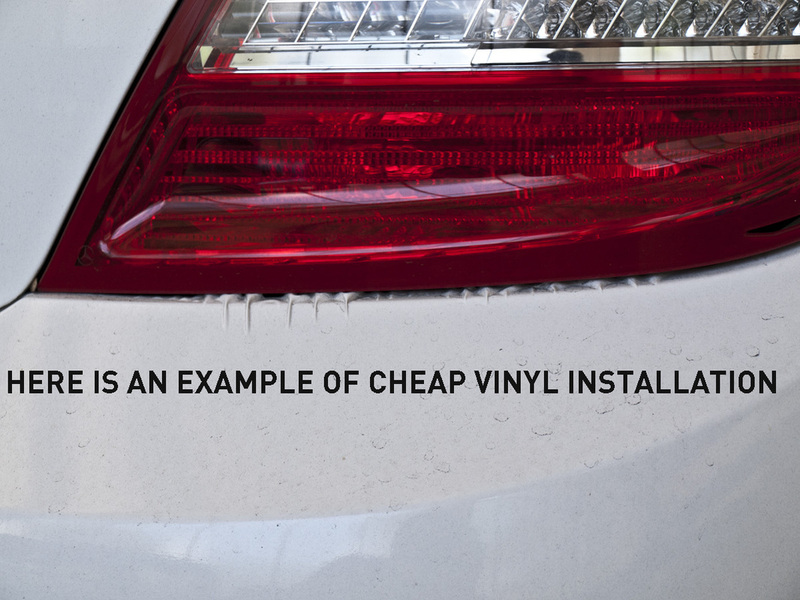 You’ve been warned by the Provinyl team. Recent customer came to PROvinyl with his brand new Volvo. His bonnet and mirrors had been wrapped and he asked us to also wrap his front bumper, roof and spoiler. 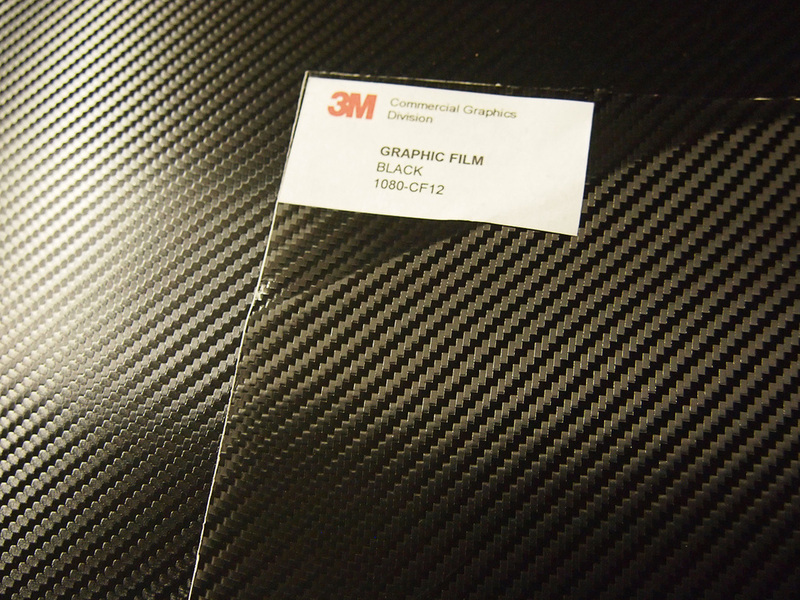 He said 3M vinyl had been used but to his shock we found that it had in fact been wrapped in a cheap chinese brand of carbon fibre. 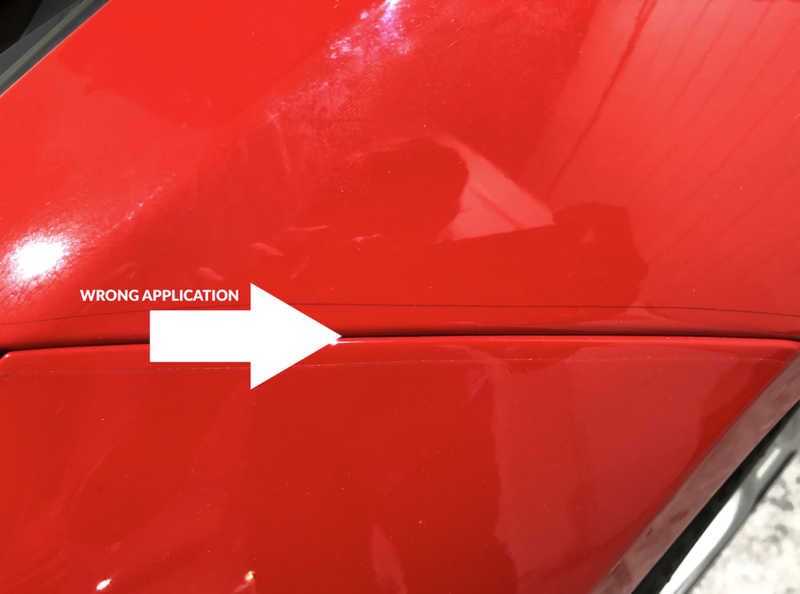 The PROvinyl team removed the old vinyl with his permission and found that the cheap vinyl had left an odd pattern on the paint which was extremely difficult to remove. 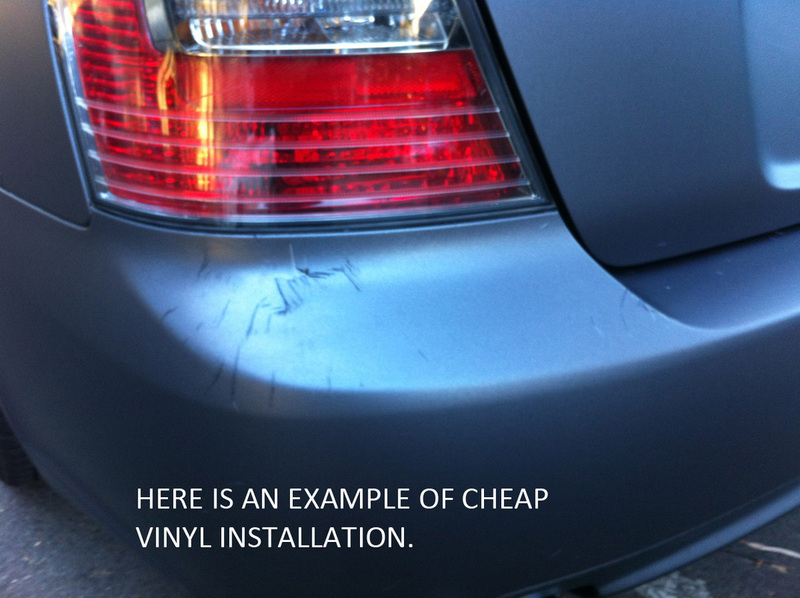 In addition, the workmanship was very poor and the bodywork had been scratched and damaged. 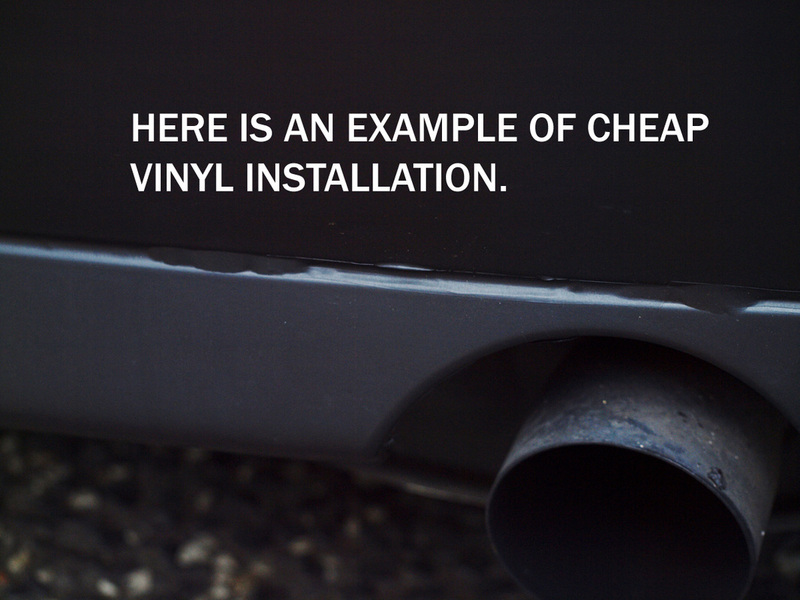 We spoke to the customer and discovered that when he bought the car brand new from the Volvo dealership they arranged for one of their trusted contractors to supply and install the vinyl. He was over-charged for the work and given no warranty or guarantee. 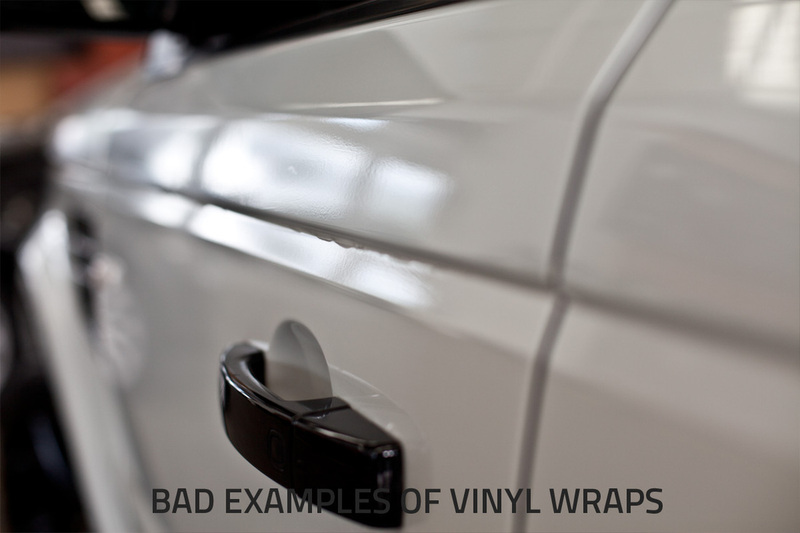 A heads up to anyone considering having their vehicle wrapped. This Brand new Mazda MPS had received some work elsewhere and quite frankly it was some of the worst workmanship the team has ever seen. 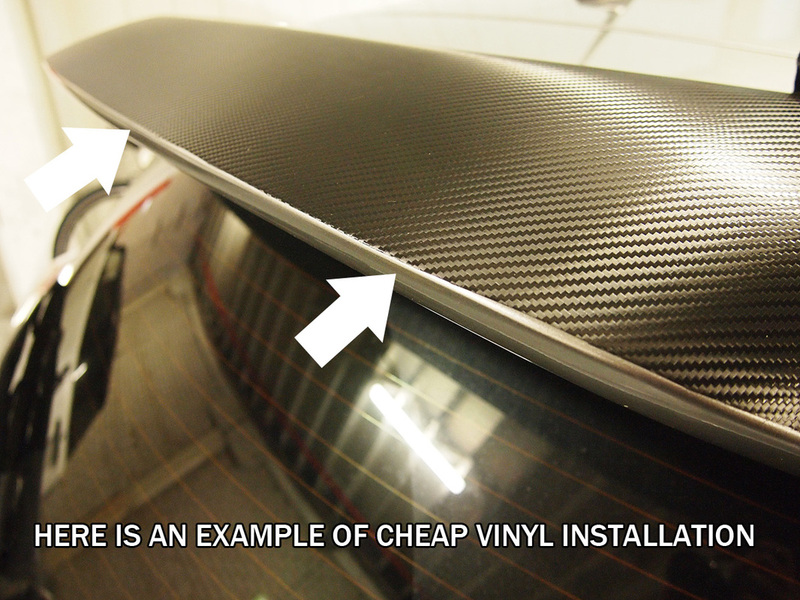 The bonnet, side skirts, spoiler, mirrors and nose of the car had been wrapped in 3M carbon fibre vinyl to a very poor standard. 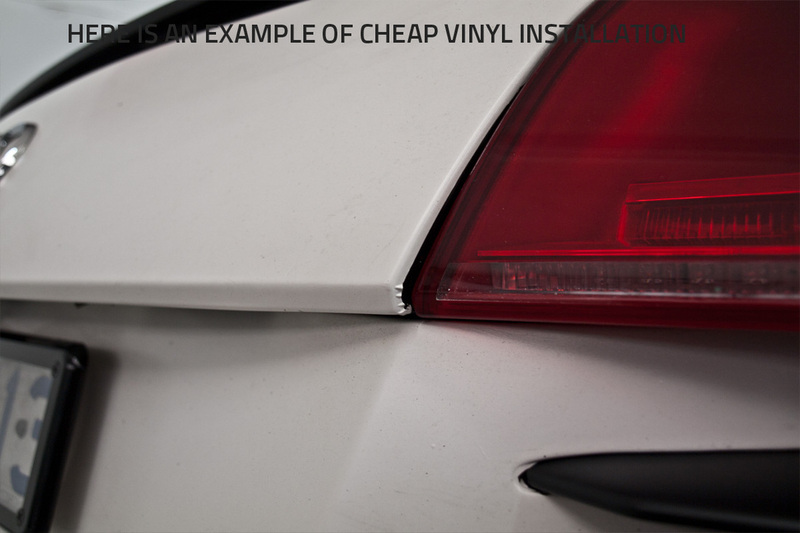 The bodywork paint had been severely damaged on every panel as a result of hand cutting the vinyl against the paintwork. Not only was this clearly visible but none of the lines were straight! 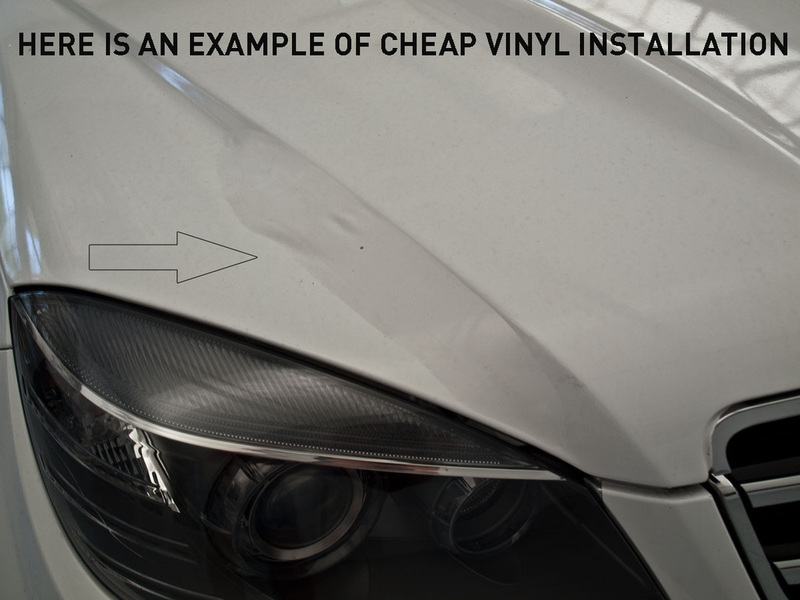 To add to all the poor workmanship the side skirts had been applied in several patches for no reason. 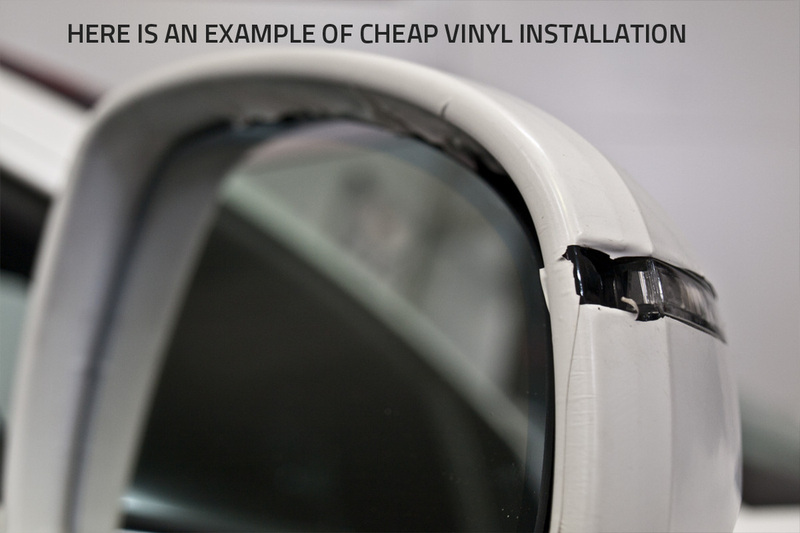 Don’t trust just any one with your car - research and go and see their workmanship. 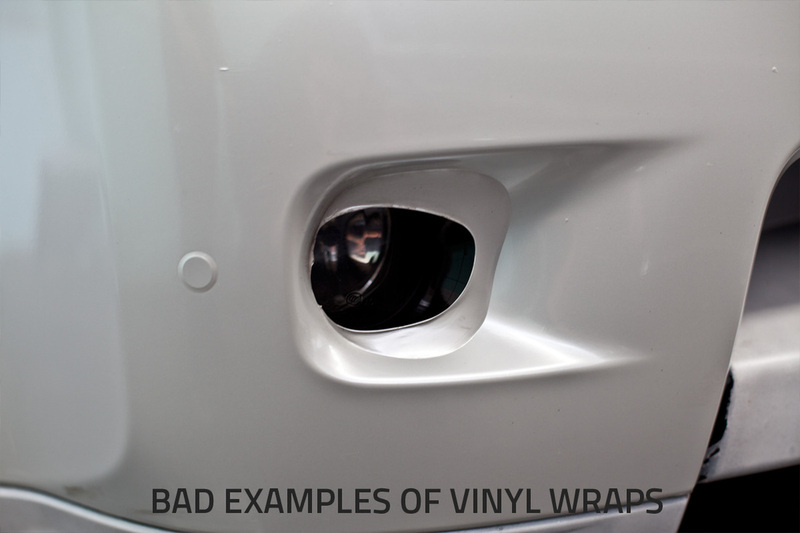 Fortunately, we re-wrapped this customer’s vehicle to the PROvinyl standard. Ah the old 'my mate said his mate could do it for me'!! Never ends well when we hear this and the range rover that showed up is a perfect example of what to expect when the cheap or convenient option is the one taken. 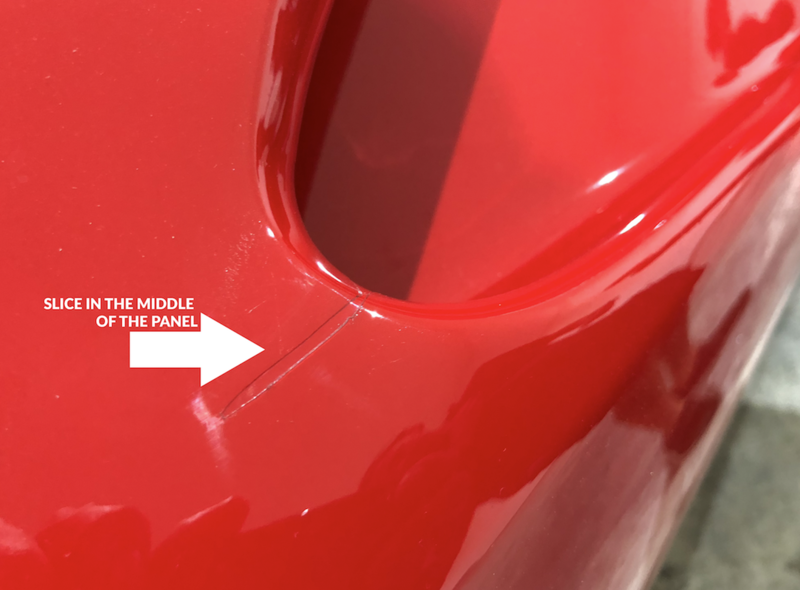 With crazy joins and overlaps, bubbles and horrible wrapping at panel edges the only way to fix it was to peel it off and bin it. It can be removed so not such a big deal right?.........WRONG!!! 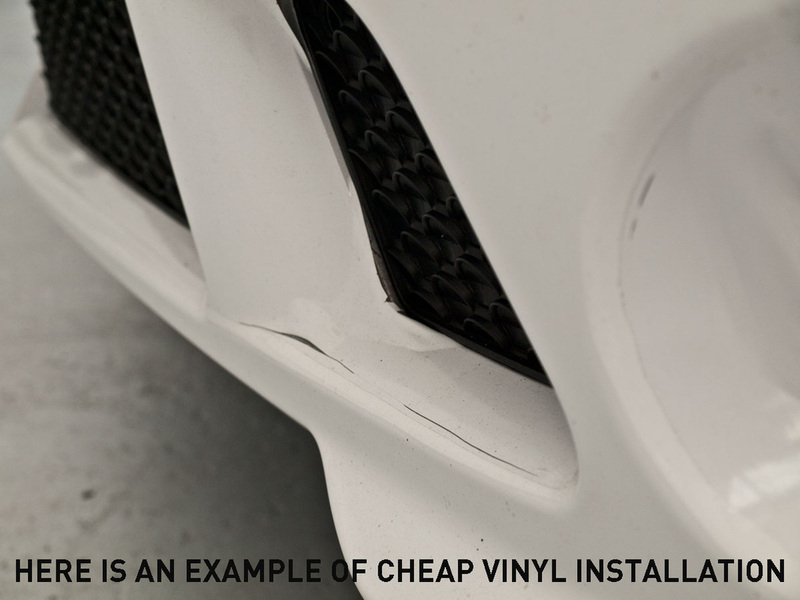 With the vinyl off the truth was exposed in the form of slice marks all through the paint where the installer (if you would call them that) cut everything by hand! 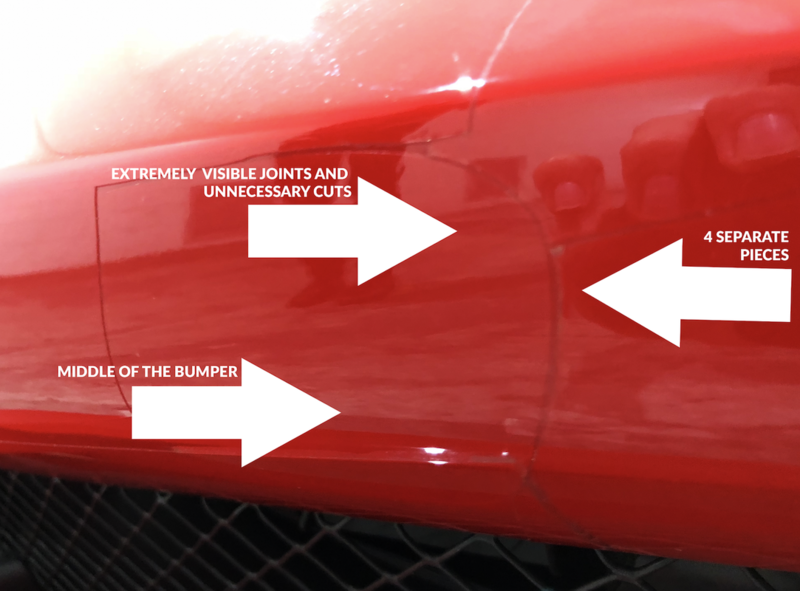 Ferrari 458 - unprofessional paint protection film installation. Don’t let them take you for a ride! 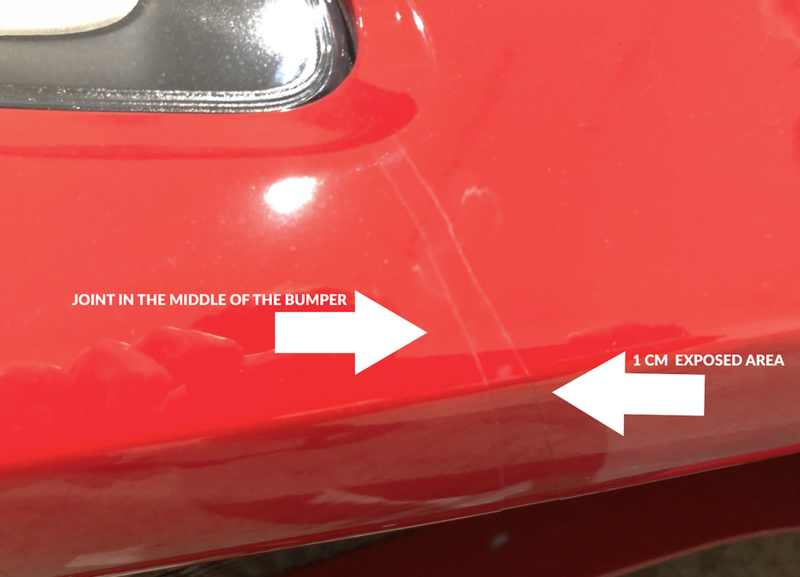 Here we see an example of a car which has had a rather bad paint protection film wrap done on it, and how you can avoid being the next victim. 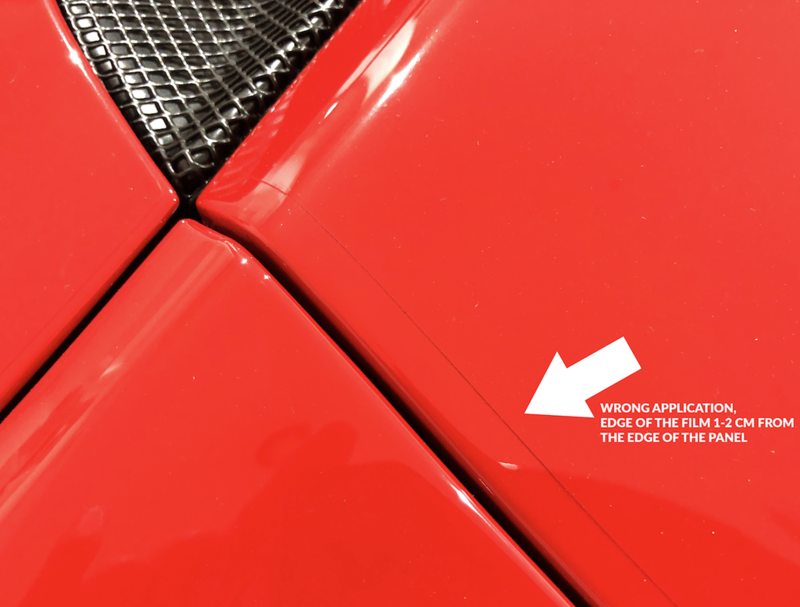 This beautiful Ferrari 458 was brought to us by a customer, who had previously done a paint protection film wrap with a previous company, but was left less than impressed after the completion of this shoddy work. 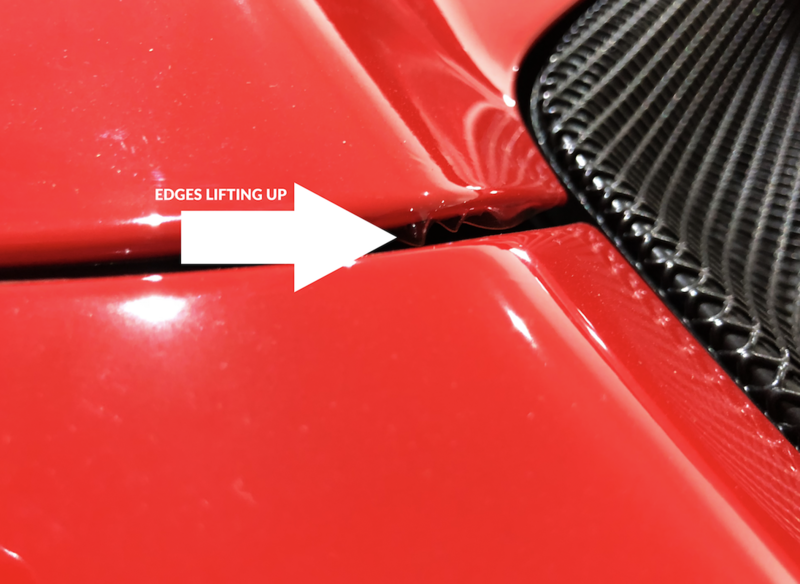 You can see an unnecessary joint in place, and is not aligned, exposing 1cm of body panel work, which can be easily damaged. 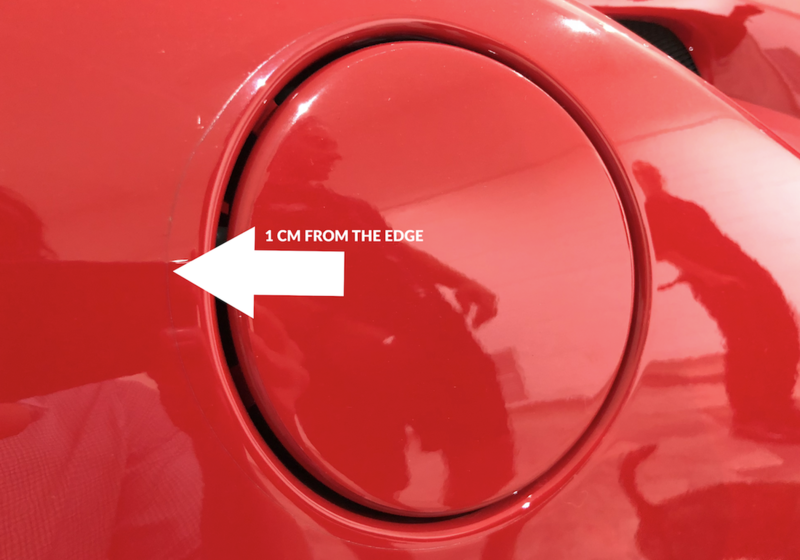 This may be due to the incorrect template and/or measurements being put into the template, resulting in uneven coverage. 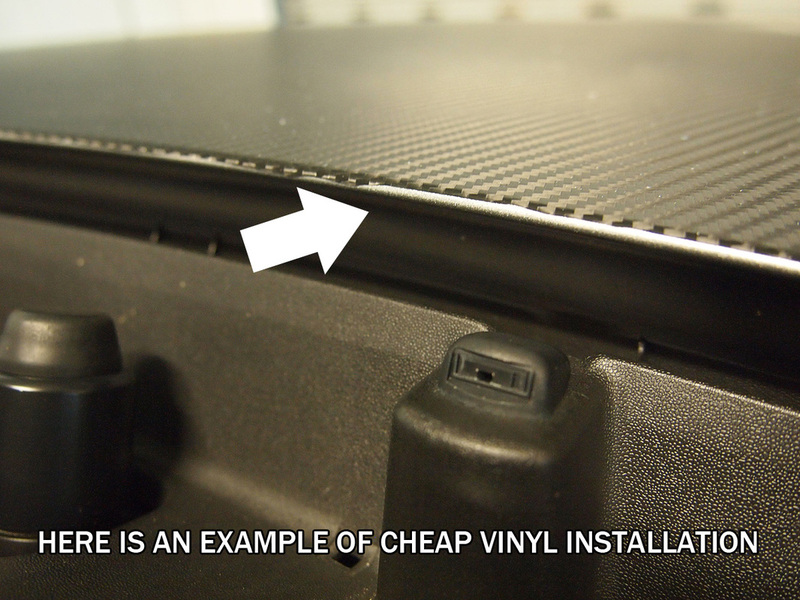 Wrong installation, area is still exposed, edge of film to edge of panel bigger than it’s supposed to be. Witht his picture, we can see various places where the template has not been fitted correctly, and has tried to be fixed by attaching separate pieces to cover up joints. 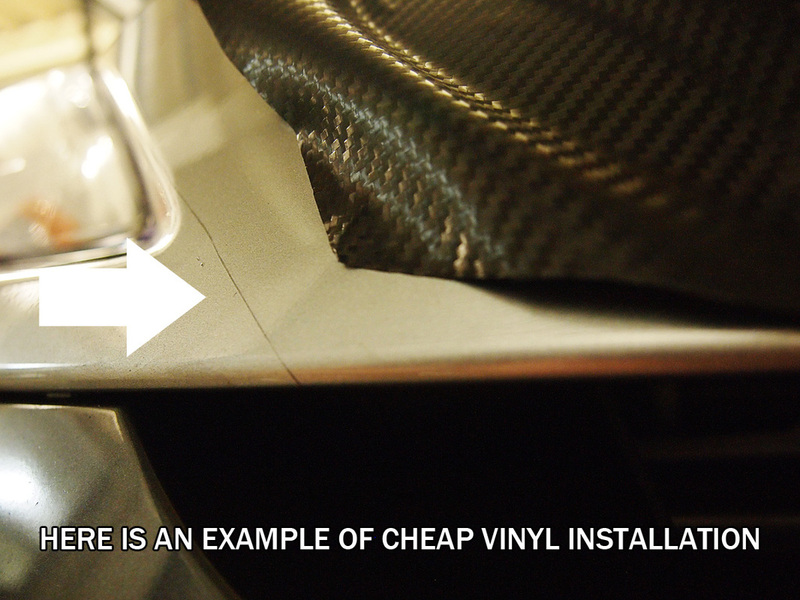 PPF needs to go to the edge of a panel before it’s wrapped, and it also requires specialist technicians to understand the thickness of the film, therefore knowing how to wrap it properly to prevent any ill-fitting parts. 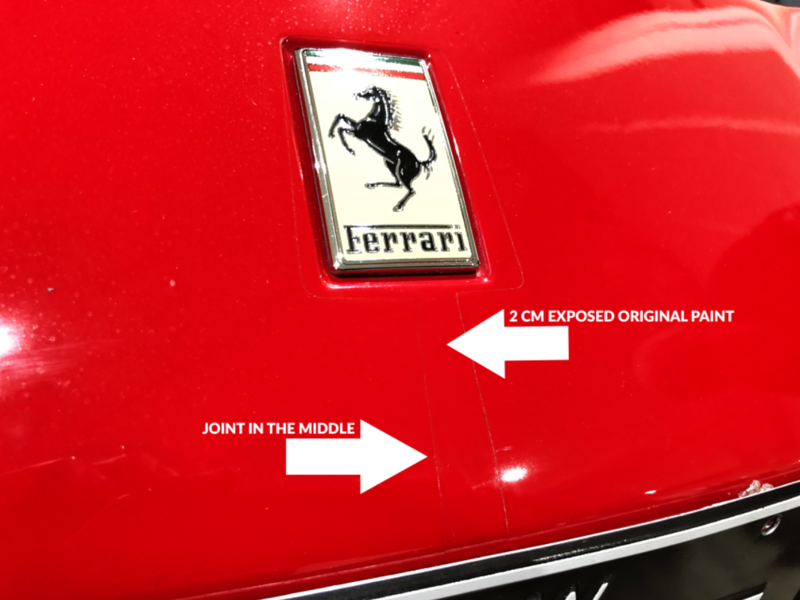 Our fourth example is similar to what we saw in the previous example, where the installer failed to measure out the template properly, resulting in gaps between the film, such as this area beneath the Ferrari badge. 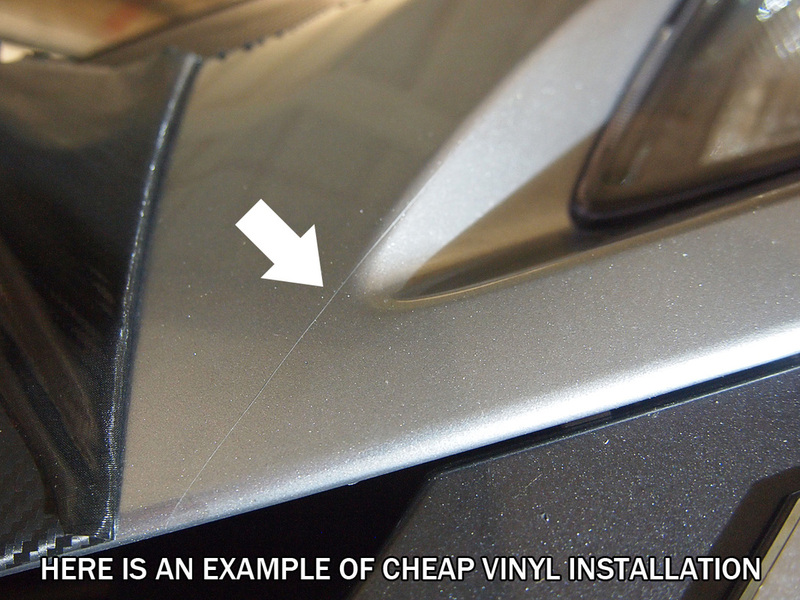 This is especially bad considering how much more likely the bonnet is to be struck by stone chips or scratches. All parts need to be covered without any gaps. 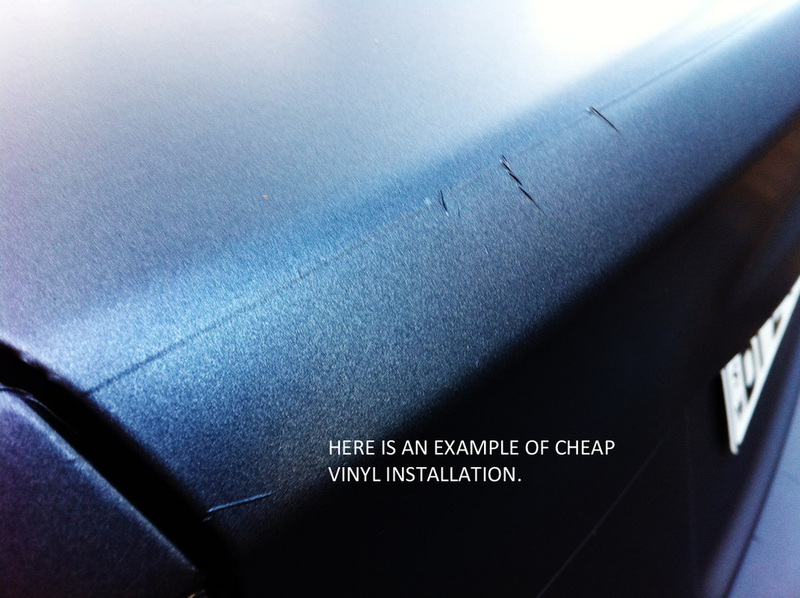 In our sixth example, we clearly see the same as in example 3, where the installer has failed to wrap the film close the edges of the cars and in the crevices, leaving areas prone to damage. 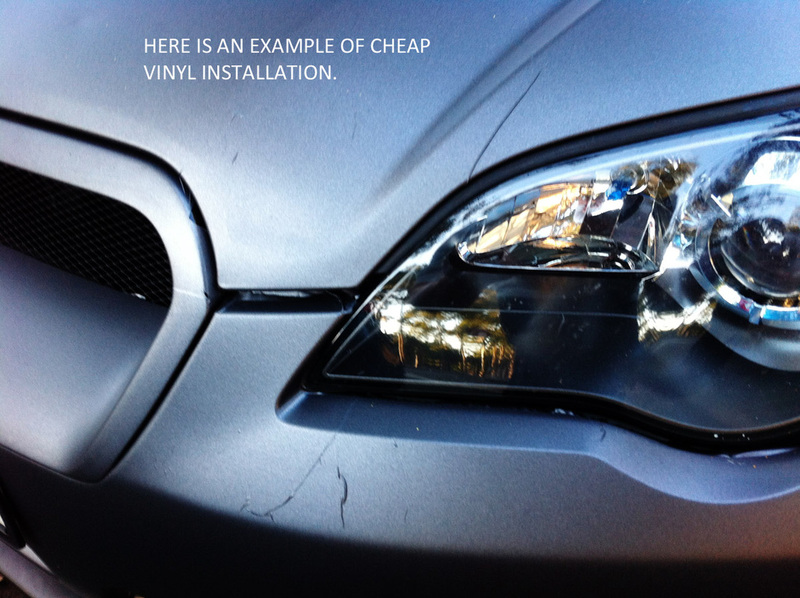 Damage that could easily have ben prevented if the installer had wrapped the car properly. 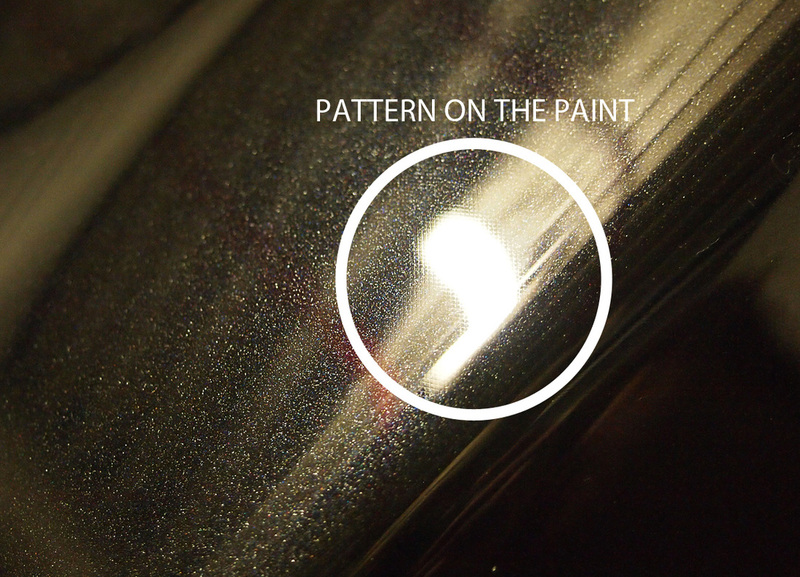 While PPF is advanced in its ability to prevent paint damage to your vehicle, it’s application process remains in the hands of many people who fail to understand how to properly cover a car in the film. 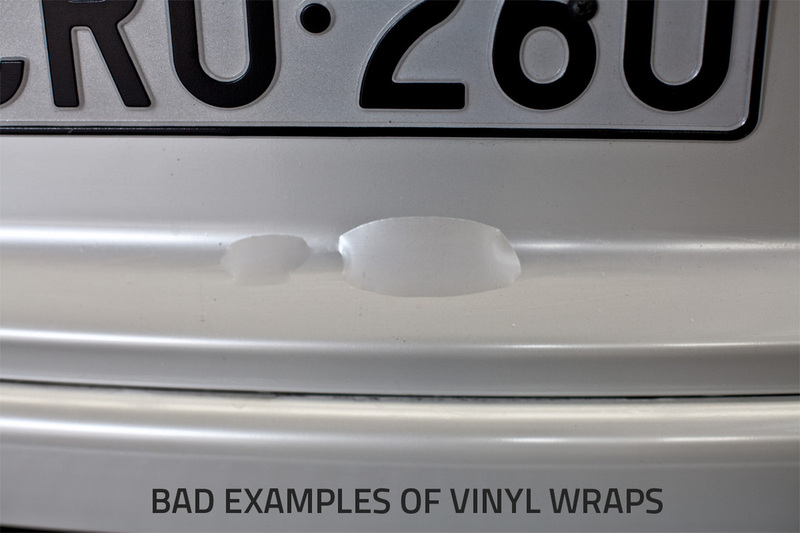 Keep an eye out for these examples on any car you come across with PPF, and make sure that you go to the right place for your vehicle protection. Contact us for any information you may need, or any questions you may have, and we can even help direct you to experienced professionals!